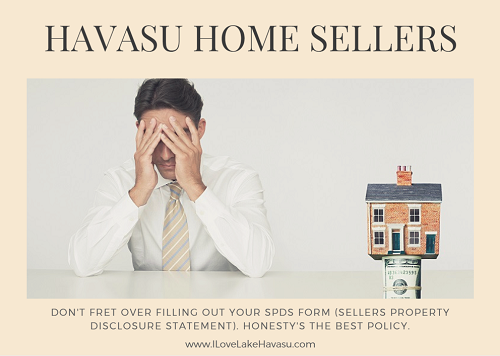 When you sell your Lake Havasu home, you will most likely be filling out a SPDS form (pronounced “spuds”). Are you wondering what potatoes have to do with selling a home? Nothing. In this case, SPDS stands for the “Sellers Property Disclosure Statement”. On this form, you disclose anything you know (good and bad) about the condition of your property. But, Havasu home sellers shouldn’t fret over the SPDS form. It is actually meant to protect you. What is the SPDS Form? The SPDS form was created by Arizona REALTORS@ to make it easier for sellers to make the proper disclosures as required by statute. On this form, it asks you about who owned the property, its structural integrity (any roof leaks, heating and cooling problems, issues with the swimming pool, etc. ), the utilities, sewer, and any environmental issues. All you need to do is answer each question to the best of your ability. Did you need to replace the swimming pool pump after you moved in? Say why and be prepared to possibly show proof of the work done to an interested buyer. Did the previous owner tell you that they needed to fix a leaky pipe under the foundation? You’ll need to disclose that as well. Even if issues arose before you purchased the property, you must let the buyer know about it if you were told about it personally. Never experienced a problem with whatever was fixed by the previous owner? You can let the buyer know that as well. You might want to have a home inspection performed before you put your home on the market. This addresses potential issues that may arise when a buyer is interested in your property. It also gives you a chance to correct any problems before you sell. The better shape your home is in, the better the price you’ll receive. Then, you can confidently explain how you took care of any problems that the SPDS form asks about. Above all else, be honest. If you truly do not know the answer to a question on the SPDS form, you can always mark the “I don’t know” box. Don’t try to answer a question with a “yes” or “no” when you don’t really know the answer. The buyer could come back and sue for an issue that arises if you weren’t completely honest on your SPDS form. However, you can’t be held responsible for what you don’t know. When in doubt, ask your Lake Havasu REALTOR@ for their advice.